Rosetta Frankforter was born in Beerta (Groningen) on the 2nd of May 1866 and married on the 15th of July 1899 in her place of birth to Jakob Klein, who was born on the 23rd of July 1862 in Stadskanaal. They had two children: daughter Gholina (born in 1901) and son Adolf (born in the same year). Jakob Klein died on the 4th of October 1903 in Musselkanaal. Rosetta Frankforter was the mother of Adolf Klein, textile trader in the Kruisstraat. 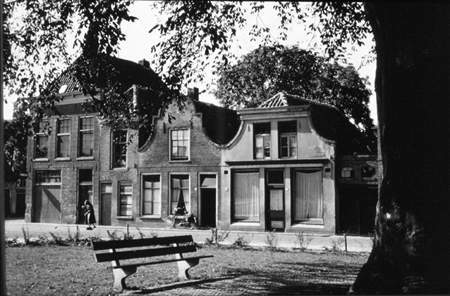 After the death of her husband Jakob, she moved to Meppel in 1903, probably to live closer to her son. It is possible that this move was for business reasons, because for a long time she ran a grocery shop at 17 Touwstraat. It was the only grocery shop that sold kosher products in Meppel. 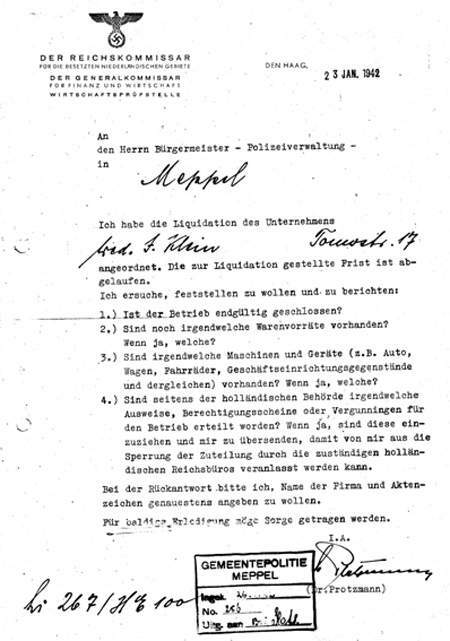 The only information known about the shop is in a letter from the Generalkommissar für Finanz und Wirtschaft (General Commissioner for Finance and Economy, Dr Protzmann). He asked the council of Meppel for the status of the liquidation of the shop of Mrs Klein. The council answered him that everything went according to plan and the shop was closed on the 26th of January 1942. Some time after, the shop was cleared and the formal liquidation was completed. the widow Klein was cleared and closed. At the beginning of May 1941 Rosetta’s radio was confiscated. Obviously she had to declare that the radio had not been exchanged for an inferior model. In the night of 2nd and 3rd of October 1942 Rosetta was taken from her house to the railway station where she and 170 fellow citizens had to wait for hours for the train to Westerbork. The train left at 7.30 in the morning. At the station of Hooghalen the passengers left the train, then followed, certainly for the 76-year-old Rosetta, the dreadful walk to Kamp Westerbork. There she only stayed for two days. On the 5th of October she was deported to Auschwitz, where she was gassed on the 8th of October.